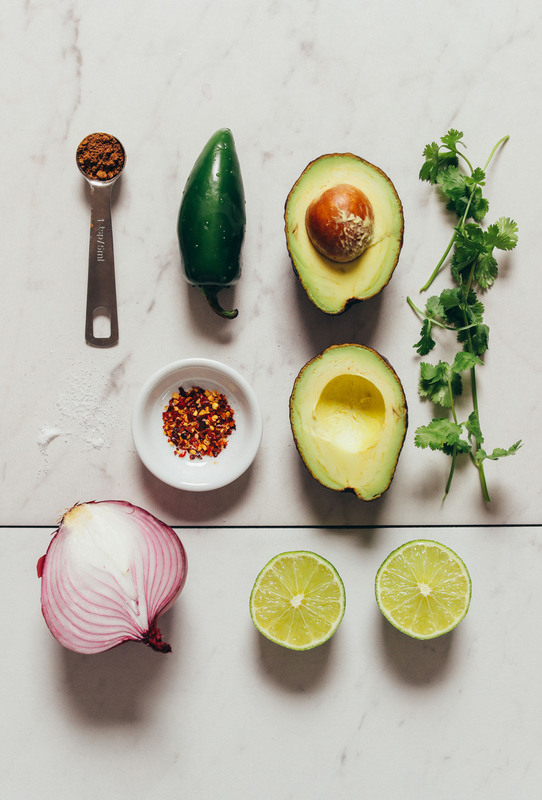 This guacamole is so quick and easy to make and it all starts with ripe avocados. If you’re unsure how to pick ripe, healthy avocados, I like to go for ones that are closer to black than green, are tender but not mushy, and don’t appear to have any blemishes or mealy spots. If you’re unsure if the avocado is past its prime, you can remove the little stem at the top of the avocado. If it has a green color to it, it’s still fresh! On the other hand, if it’s gone brown, it’s probably past its prime. If you’ve picked avocados that are ripe and ready to use, either use within 1-2 days or throw in the refrigerator where they’ll keep fresh for 5-7 days. The refrigerator seems to slow the ripening process. 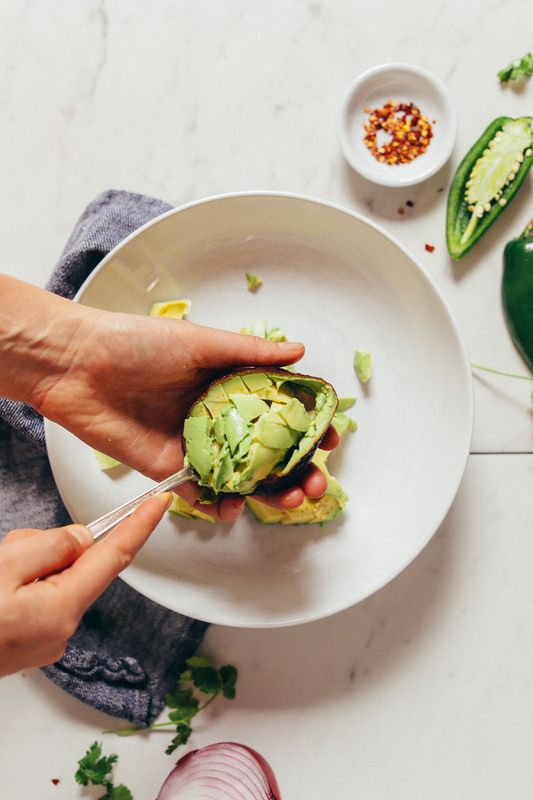 If you’ve picked firm or unripe avocados, let them ripen on your counter at room temperature until no longer firm to the touch (I like setting mine in a produce bowl near other things that are ripening — especially bananas — as they seem to help each other along). Ripe avocados should have some give, but do not feel mushy when squeezed. 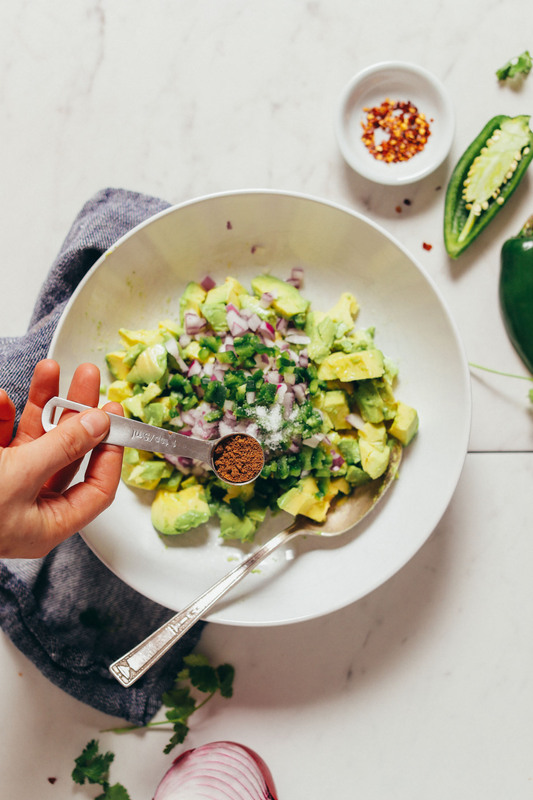 Add your ripe avocados to a mixing or serving bowl along with onion, jalapeño, cumin, salt, red pepper flake, and lime juice and mash to your desired consistency. If you like a little chunkiness, take it easy and just aim to incorporate the flavors. If you prefer your guacamole on the creamier side, a potato masher can be helpful, or just use a fork and mash until smooth. At this point you can add in your cilantro (it’s more delicate so it’s better not to over-mix it), along with any additional seasonings to taste. And that’s it! Perfect guacamole every time. & Perfect for SO many dishes! 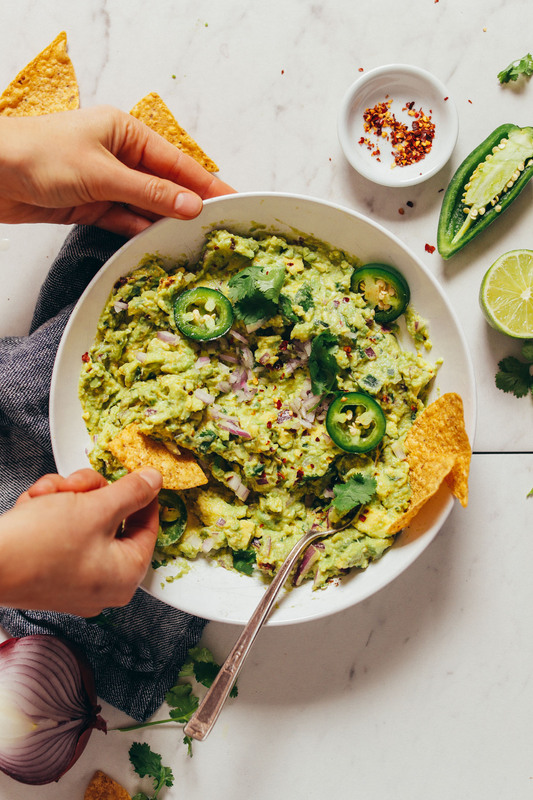 This guacamole is ideal for dipping with your favorite tortilla chips or veggies. Pair with our favorite Ginger Beer Margaritas for the ultimate happy hour treat! 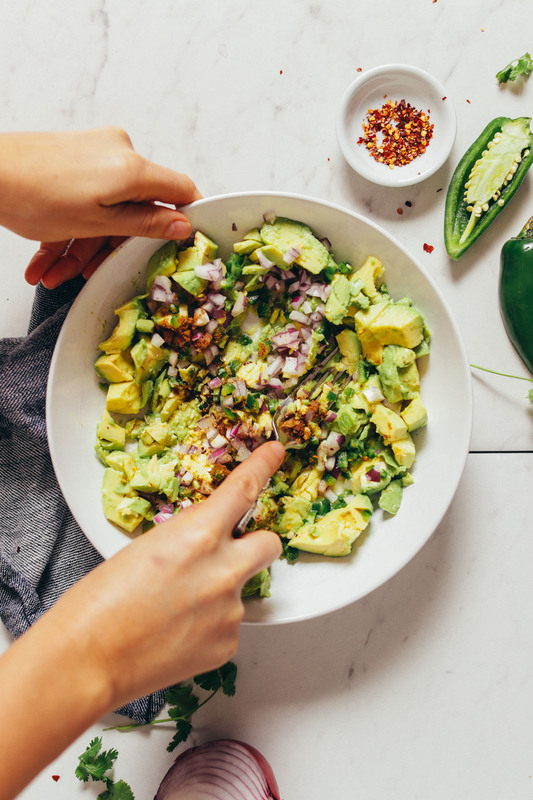 For more Mexican-inspired dishes, be sure to check out our Easy Red Salsa, Roasted Jalapeño Vegan Queso, Vegan 7-Layer Mexican Dip, and these 14 other Mexican-Inspired Vegan Dishes! 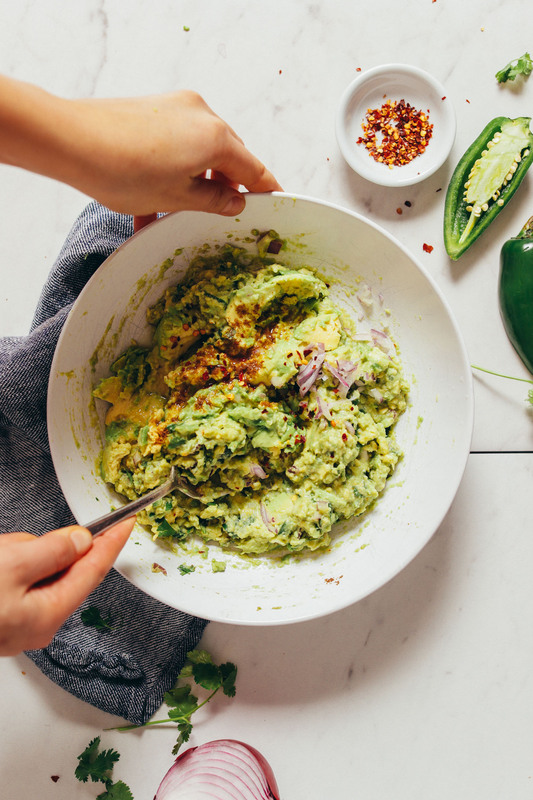 Incredibly creamy, flavorful guacamole ready in just 1 bowl, 10 minutes, and with 8 ingredients! The perfect dip for Mexican night! 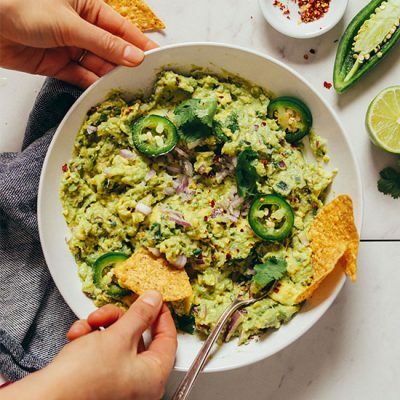 Add avocado, onion, jalapeño, lime, salt, cumin, and red pepper flake to a shallow mixing or serving bowl and mash with a fork or potato masher. Add cilantro and stir. Then taste and adjust flavor as needed, adding more lime (or lemon) for acidity, cumin for smokiness, red pepper flake for spice, cilantro for herbal flavor, or salt to taste. Serve immediately with chips or veggies of choice. Store leftovers well covered up to 2-3 days in the refrigerator, though best when fresh. 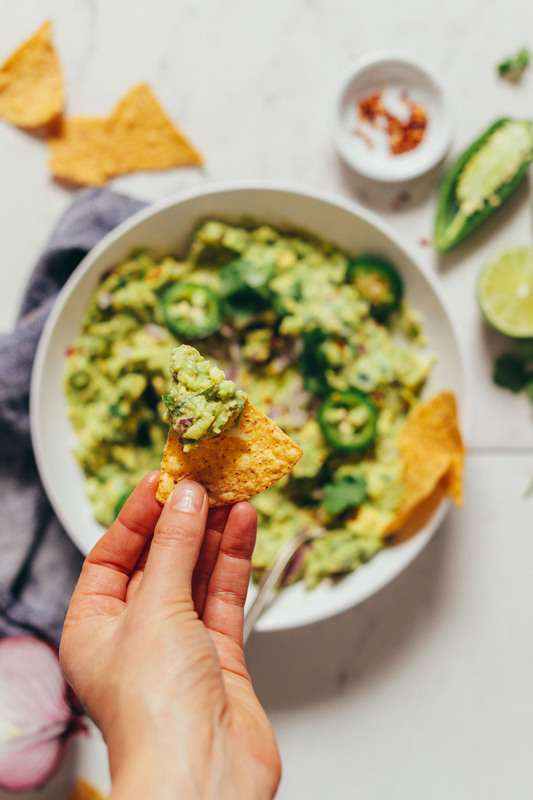 To extend freshness, squeeze a little more lime juice over the top of the guacamole (to prevent oxidation) before storing. And make sure a lid or plastic wrap is touching the surface of the guacamole (this also helps prevent oxidation). If the top appears slightly browned after storing, just scoop off the very top layer and the guacamole underneath is usually fine! *2 small-medium avocados equal about 1 ½ cups small cubes lightly packed. *Nutrition information is a rough estimate for 7 (1/4-cup) servings (as the recipe is written). I added the maximum amount of lime without tasting and I wish I had stopped at 2 Tbsp. lime… all we could taste in my batch was the lime! I know this will be a hit once I amp up the spice and tone down the lime. Delicious! 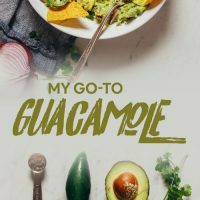 Nice to see a guac recipe without garlic too as I seriously dislike it. Great site too 👍 thank you. I loveee this recipe! I’m a bit of a crazy spice person so I up the intensity with more jalapenos, not de-seeded, but this is so yummy. Your recipes and beautiful photos always make me hungry! Wow, this was fantastic. We normally add chopped tomatoes or even salsa. I never thought of making it without them. We will certainly make this again! Hi I got loads of cheap avocados today they won’t last long….if I make this would it freeze? I wouldn’t recommend freezing this guac! Sorry! I find if you want to make it in advance for a few hours the best way to stop it going brownish is to put the avocado stone back in with the guac -it works like magic! BTW I’m from the UK and the absolute best avocadoes Ive ever had were when we holidayed in the US- particularly in southern California -they were amazing and made the best guacamole Ive ever had! No exaggeration, those are some of the most beautiful avocados I have EVER seen. They look stunning with their creaminess, color, and I can even just tell how tasty they are by the photos alone! Guacamole is such a winner for everyone and every event. It’s unfortunate that my dad is allergic to avocados, so he misses out on how marvelous guacamole is! Delicious! I subbed cayenne for salt to lower sodium, still delicious! Lovely! Thanks for sharing, Susan. Thankyou for this recipe. It is awesome. I am sitting right now with a nice crunchy veg tray with tortilla chips and your guacamole. It is so perfect as I didn’t feel like cooking tonight! I can’t do cilantro (I’m one of those people who think it tastes like soap)… do you think I need to add anything else if I leave it out? Nope, I would just omit! We hope you enjoy it, Valentina! Have a great trip away! 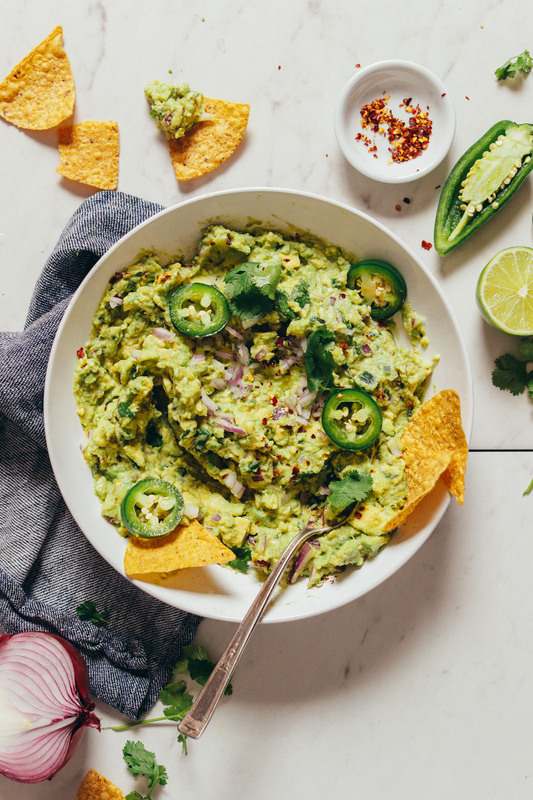 Wow, guacamole is just what this hump day needs. Thank you so much for sharing! While visiting my brother in Santa Fe, NM, we spent a day enjoying a “food crawl”, driving the entire day sight seeing and visiting places known for an exceptional dish. One such place was lauded for their guac. The one ingedient that you missed that took it to a new level is garlic.